Askasu is a brand of alternative clothing. All outfits are designed and handmade by Joanna. Most of the designs shown on Facebook and Instagram are eventually sold through our shop on Etsy – a single piece of each. We usually add several items at a time, twice a month. Because of the limited amount of items – Joanna is the only designer and maker – they sell quickly. That’s why we have a newsletter you can subscribe to. We send e-mails about new arrivals in advance, with measurements and photos. 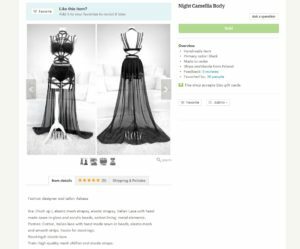 Typical price range for an outfit on Etsy is 500 USD (lingerie) – 1000 USD (gowns) plus shipping. More varied sizes were introduced recently. The current size range for most dresses and lingerie is European S/M/L. For example, hip 85-110 cm (33-43 in). Subscribe to the newsletter about new Etsy shop arrivals. Usually sent twice a month. Requests for individual orders are possible, but it depends on a variety of factors whether a commission can be taken. A custom order is a matter of time and materials. Wait times can be several months long. The cost is also higher than for the ready-made items in the shop. Currently custom orders are fully booked – sadly, I can’t take new ones now. The shop on Etsy is the way to buy. Please follow the newsletter above if you’re interested in new arrivals. Please note that lace-based designs depend on specific, often unique textiles, so some of them can’t be made again to order – or we may need more time to buy the materials.